This is a lengthy family saga full of great Canadiana -- the Rocky Mountains, American fossil hunters, generations of families descended from wilderness guides and such, the history of the Canadian Parks System, Ottawa bureaucrats, winter storms that people are lost in -- what else might be added? If you love family stories over three generations, if you love books in which the setting becomes a character, if you have the strange predilection that I do for books featuring three sisters, then I suggest you give this one a try. 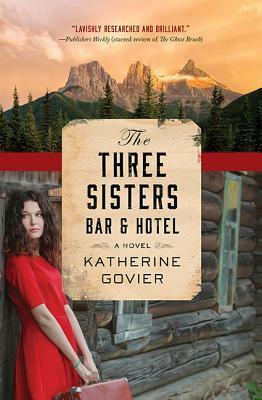 It begins in Gateway, Alberta, in 1911 (and Gateway is strangely reminiscent of Canmore, as a mountain town with a view of the Three Sisters, iconic mountain peaks that I've seen myself). Gateway is a town that's rough and rules itself, and the government's meddling while turning the landscape into a national park isn't much appreciated by the independent souls who live there. This set of characters eventually interacts with the story of two civil servants charged with the paperwork to kick off the Parks System. The two threads don't mesh all that well, though; jumping back to dreary office life in Ottawa feels a bit dull after reading about mountain exploration, blizzards and disappearances in Alberta. Actually, the book is structured in four parts, focusing on past -- Herbie's story, and a section focused on the Ottawa parks people (which could have been condensed significantly, I think) -- and present, in which Herbie's 3 granddaughters are called back to Gateway by their elderly parents after said parents decided it was a brilliant idea to buy the old hotel and restore it with their daughters' help. I loved the setting and the scientific element of the fossil expedition, in particular; I love sciencey content in my fiction! Many of the characters of that era were really engaging. I felt less fond of the current day story, as redoing an old building with your parents and adult siblings just isn't as wildly fascinating as riding off into the uncharted mountains and facing down nature. I also thought the segments about the Parks staff were interesting (the long-suffering secretary was wonderful) but could have made another whole novel instead of being too much with us in this one. But if you'd like to read a book about the wilds of Alberta in 1911 and onward, this is a great choice. Lots of history and research in this story, and a setting that is evocative and beautiful. **If you're interested, you can listen to a brief interview about this book which Katherine Govier gave on The Next Chapter a year ago.